The Orchid Review is more than 100 years old and became the orchid journal of the Royal Horticultural Society in 1993. Edited by Sarah Forsyth, it is published quarterly and is the European Orchid Council's official journal. 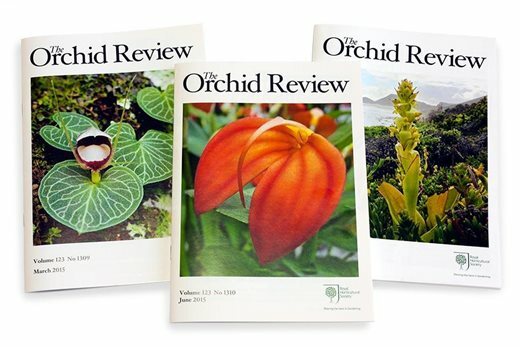 Issues of The Orchid Review dating from 2001 to 2009 are now available at the reduced price of £4 each (UK p&p free) on a first-come, first-served basis. Please email or telephone your list of requirements, postal address and preferred method of payment (card or cheque) to Melanie Steel (melaniesteel@rhs.org.uk, tel 01733 294676) and you will be informed of availability, cost and postage if required. To subscribe or renew your subscription, please call 020 3176 5810 (Mon-Fri, 9am-5pm UK time, excluding Bank Holidays). From overseas please call +44 203 176 5810.